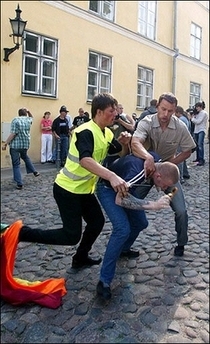 Anti-gay protesters armed with stones and sticks attacked a march for homosexual rights in Estonia, injuring around a dozen people in a country that prides itself on its tolerance, organizers said. Around 20 young men attacked the parade as some 500 gay-rights supporters with rainbow-coloured flags made their way through the winding streets of the capital, Tallinn, in Estonia's third such annual event, according to march officials. Parade spokeswoman Lisette Kampus said about 12 people were injured, including a Frenchman who needed to be hospitalized with a head injury. Gay rights activists said they were "in shock at this absolutely unacceptable behavior." "It's particularly revolting that the gang, calling themselves Estonian patriots, attacked women demonstrators first. Then they started throwing stones and sticks at everyone," Kampus told AFP. She also criticized police. "There were too few police present so they could not really handle the violent attack." Police said they detained six people for violating public order. Only one person had so far officially complained of being attacked, police spokeswoman Julia Garanzha told AFP. The colourful gay parade set off 20 minutes late after police received a call warning that bombs would explode in Tallinn's Old Town shortly before the event was to begin. No explosive devices were found. Marchers carrying rainbow-coloured flags, the international banner of gay and lesbian movements, were earlier pelted with eggs as they began making their way through the cobblestoned streets, said Maali Kabin, another spokeswoman for the parade. Dancing to music that blared from loudspeakers, demonstrators carried placards with messages such as "Love Doesn't Ask About Gender," "Right to Be What We Are," "Children of Gays Need Protection Too," "We Heteros Support Gays," and "Anarchists Against Homophobia." "The aim of our parade is to show that we exist," Kabin said. "We don't promote a certain kind of sexual orientation, but we remind people of our right to be equal with everybody else." Despite calls from some critics to ban the march -- the culmination of a week-long gay cultural festival called Tallinn Pride -- authorities gave permission for the parade. Two earlier gay pride events held here over the past two years passed without violence. Estonia's lesbian and gay community has become more visible after the country regained independence from the Soviet Union in 1991 and became a member of the European Union in 2004. In the run-up to the Tallinn Pride week, organisers said Estonia had proved the most tolerant to homosexuals of the three Baltic states, which include Latvia and Lithuania. "Unfortunately, Estonia is now in line with Latvia and Poland, where gay and lesbian parades have been viciously attacked," Kampus said. A poll conducted in June showed that one in four Estonians would not want to live next door to a homosexual. The survey was commissioned by the Postimees newspaper after the Dutch ambassador to Estonia, Hans Glaubitz, asked to be transferred to another posting, saying his partner -- a black, gay male -- had been harassed. A gay parade in neighbouring Latvia was banned last month. Alternative gay pride events ended violently with homosexuals, journalists and tourists assaulted and 14 people arrested. Hundreds of protesters blockaded gay-rights activists including a Dutch European lawmaker inside a church in central Riga and pelted them with excrement as they left.